The all-new Maruti Dzire, one of the most awaited cars of 2017, has been launched and has already received over 33,000 bookings! The craze proves the popularity of the model and the confidence customers have on the product. The 2017 Maruti Dzire is now in its third generation and Maruti Suzuki has made sure that the Dzire has been updated to suit the current expectations of the customers and then some more. The design of the new Dzire is nothing short of revolutionary. The car now looks like a proper three-box sedan despite being a sub-4-metre model, unlike the first two generations. Don’t get me wrong but the first gen Dzire was a Swift with a bulged out boot that looked ungainly and the second gen Dzire looked like a sloppy liposuction job. Both models sold in lakhs though (over 1.38 million units), proving that Maruti knows to sell. 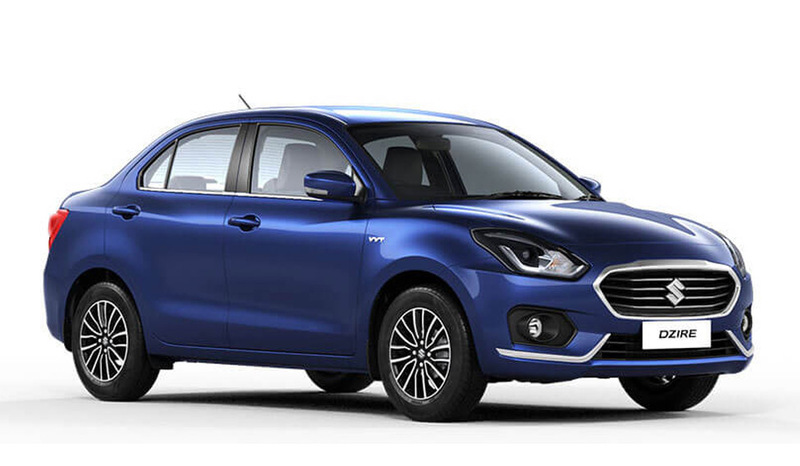 But this new generation Dzire looks like it has finally earned its name. I think Maruti also thought the same and dropped the Swift prefix that was present in the first two generations, making the Dzire stand on its own. 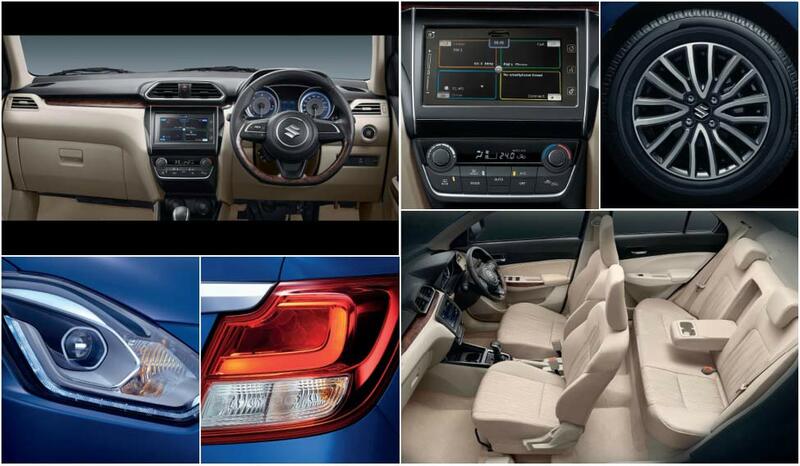 With both the exterior and interior, Maruti has gone the premium route for the new Dzire. The car now looks the part, shedding away the not-so-good-looking skin and looks like a proper sedan. Though the length of the car remains the same, Maruti has squeezed out 55mm more leg room and 62 litres more boot space. The Dzire is also wider by 40mm than the outgoing car and all this has translated in making the car more spacious. The Dzire’s exterior has smooth flowing lines and, as is the Indian norm, more chrome around the front grille, front bumper and in the boot. The LED headlamp unit looks neat and attractive, especially the daytime running lights. The overall face is much different than the old car and is fresh, with a chrome surround grille with horizontal slats and a complimenting front grille. The side profile of the Dzire now looks well balanced and the 14-spoke alloy wheels add to the premium feel. To the rear, the LED tail lamps are nicely shaped and a thick chrome strip runs the length of the boot. Hop inside and an airy cabin welcomes you with its black and beige theme with faux wood highlights. Though several parts are carried over from the previous car, the Dzire still looks fresh thanks to a new dashboard with a new instrument cluster and a centre console hosting the Smartplay infotainment system (for ZXi+ and ZDi+) and automatic climate control layout. The Smartplay system is similar to the latest Maruti cars such as Ignis and Brezza, and supports Android Auto, Apple CarPlay and Mirror Link. The front seats are spacious and support your posture well while the rear seats offer better leg room and overall space. The engines have been refined for better NVH levels and better fuel efficiency, thanks to the lighter HEARTECT platform. The AMT is available for both petrol and diesel engines. 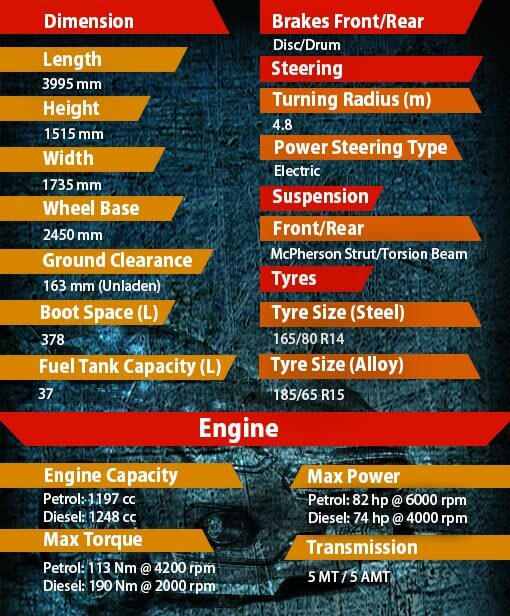 The petrol engine makes a maximum power of 82 hp and 113 Nm of torque while the diesel engine makes 74 hp and 190 Nm. The diesel engine now returns a fuel economy of 28.4 km/l, making it India’s most fuel efficient sedan, while the Dzire Petrol has a fuel efficiency of 22 km/l. The Dzire comes with ABS with EBD & Brake Assist and dual airbags as standard across all the variants. While features like keyless entry, rear AC vents, electric adjustable ORVMs, height adjustable driver seat, parking sensors are available from the mid variants, only top end variants gets LED projector headlamps, Smartplay, engine push start/stop button and automatic climate control. The Dzire is available in six colours—Oxford Blue, Gallant Red, Sherwood Brown, Magma Grey, Silky Silver and Pearl Arctic White. While there was no doubt that the new Dzire will be a success, being a proven brand already, how Maruti has made the new Dzire was the question. All we say is that the Dzire is now complete.